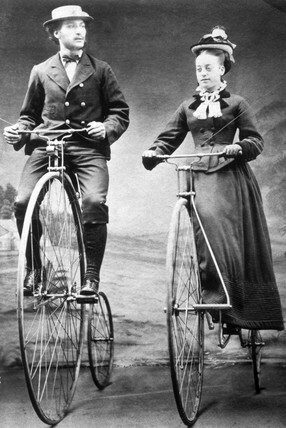 Although the high wheel bicycle was ridden primarily by young, middle class men, women too had their own design of the bicycle. In 1874, Starley produced an “Ariel” specifically for ladies. It had a side-saddle and the pedals drove cranks through levers which were pivoted in front of, and slightly above, the front wheel axle. Connecting rods communicated the pedal motion to the overhang crank shaft. Because of the side saddle position, the handlebars were shortened on one side and lengthened on the other. The rear wheel was mounted on an overhung axle instead of the usual arrangement of a spindle carried within a fork. The track of the front wheel was offset from that of the rear wheel to counteract the bias from the side saddle position. high wheel bicycle, high wheeler, penny farthing and ordinary are all terms used to describe the first vehicle to be called "bicycle"